Landscape of large rectangular fields based on lower slopes of the Clwydian hills, representing remodelling of medieval park during the second half of the 16th century. Lower, west-facing, slopes of the Clwydian hills, at a height of between about 80-160m. Bathafarn Hall appears to have been first established during the Elizabethan period, though the present building, with a stand of trees to the east, is 19th-century stucco with brick stable block. Bathafarn Farm has an 18th-century brick farmhouse and stone outbuildings replaced by a modern brick farmhouse and modern outbuildings. 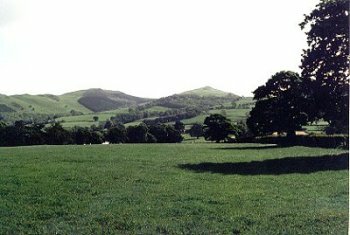 Distinctive landscape of relatively large rectangular fields set out around Bathafarn Hall, Bathafarn Farm and Bacheirig farm on lower slopes of the Clwydian hills, the fields bounded by robust hawthorn hedges and drainage ditches. Some drystone walling near entrance to Bathafarn Farm. The boundaries of the character area have been extended beyond the presumed western and southern limits of the medieval park to encompass other fields which appear to be broadly contemporary with the subdivision of the former park. Bathafarn Hall is enclosed by former parkland and approached by means of 19th-century gates and lodge on main road. Field boundaries between the hall and Bathafarn Farm were deliberately curved to enhance the visual effect of the parkland. The grounds are described by Thomas Pennant (1793, 65): 'The grounds rise with rich cultivation from the house, and are delightfully varied with hanging woods'.